Say It Ain’t So, Dollar General Store! 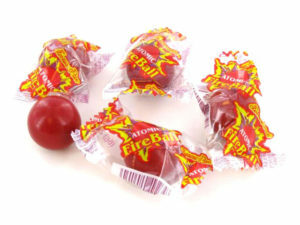 For more years than I care to admit, Atomic Fireballs have been one of my guilty little pleasures. At only 20 calories each, the individually-wrapped cinnamon candies are the ideal breath freshener and pick-me-up. They’re also delicious. I keep a handful of them in my purse. A sack in the console of my car. A bowl on the coffee table. But I’m prudent about my consumption. Several years ago, I went a little crazy and did some damage to the roof of my mouth by eating too many Fireballs. It was temporary, thank goodness, but since then I’ve tried to limit myself to just one Fireball per day. Two at the most. Now I have another reason to ration them. Dollar General Store, my go-to source for the five-ounce package of fireballs, has let me down. Hanging from the long metal hooks in the Sweet Smiles section of the candy aisle–in exactly the same spot where the genuine, made-by-Ferrara Pan Candy Company, Atomic Fireballs used to hang—are bags that, to the untrained eye, look exactly the same. But on the horizontal pink “smile” across the front of the package, where the words “Atomic Fireball” and the symbol for registered trademark used to be, are the words “Tongue Torchers.” No trademark symbol. Ever curious, I bought a package of Tongue Torchers at the Dollar General Market near Hobby Lobby a few weeks ago. This new candy was the same size, shape and color as real Fireballs. But when I tore off the cellophane and popped one into my mouth, I knew in an instant it was only a cheap imitation. The “fire” that makes you wonder how long you can keep a genuine Fireball in your mouth was missing. This was nothing more than a bland and boring piece of hard candy. A travesty to those of us with a sophisticated palate that demands the real thing. Suddenly, I had a mission. A vitally important mission. Any time I drove by a Dollar General Store, I would stop and see if they had any Atomic Fireballs left in stock. And I was going to buy up every package I could find. So far, I’ve visited five stores in Putnam County, three in White County and one in Van Buren County. In some locations, I found what I was seeking at the very back of the candy hook, with Tongue Torchers threaded in front of them. Each time, I felt as though I’d hit the lottery. So far, I’ve scored a dozen packages of authentic Atomic Fireballs. But as the days and weeks pass, they’re becoming harder and harder to find. And I’m growing ever more desperate. Each bag contains 27 Fireballs. Which means I have barely enough to get me through 2017, assuming I only eat one a day. After that, the future looks bleak indeed.